White Wolf : Baby Horse Discovers What a Sneeze is – And it Knocks Him Off His Feet! 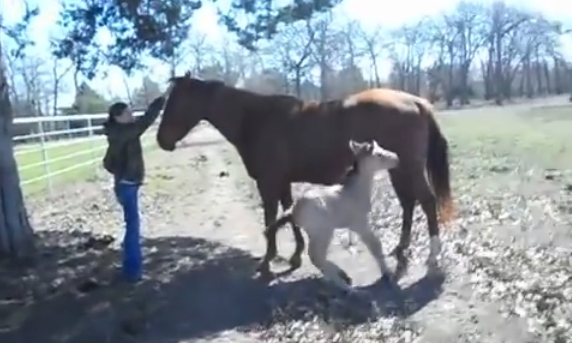 Baby Horse Discovers What a Sneeze is – And it Knocks Him Off His Feet! We’ve all had embarrassing moments, but have you ever done something so silly it knocks you right off your feet? Well, in this video, an adorable foul shocked himself so badly when he let out a sneeze so big, that he forgot gravity was holding his hooves on the ground. It’s pretty adorable to watch this baby horse discover what a sneeze is for the first time. He is just a foul after all, and likely still has a thing or two to learn about the world. His mom, who stands close by, seems completely unfazed by the little snafu – just a kid being a kid. We’re sure she’ll teach him all about much more than sneezes as he grows up, but in the meantime, we hope a camera is there to capture these little moments. Responses to "Baby Horse Discovers What a Sneeze is – And it Knocks Him Off His Feet!"